This famous photo is from the heyday of "LIFE Magazine." It was was taken in Deleitosa, Spain, in 1950, by photojournalist W. Eugene Smith. Get a load of those spindles! Is she spinning/plying flax? It would appear so by the fact that she is using her mouth, apparently to wet the fiber. Or is she working with wool and just removing a slub with her teeth? I'm just not sure. But get a load of those spindles! I have read that sometimes the yarns would be run over an overhead hook to provide more length and drying time for the yarn. What do you think? BTW, did you notice the spindles? 11/23 - Edited to add: Commenter Manise has an excellent theory: "The right fuller cop looks plied. I think she wound 2 plies side by side by hand onto the left spindle kind of like a noste and then plied it onto the right one." I think she has something, there. And the spinner may simply be biting off the strands from the supply spindle. Make sense? Many thanks to my friend Dianna in Saskatchewan for bringing the LIFE photo archive to my attention. Any party is better with accordion music, don't you think? 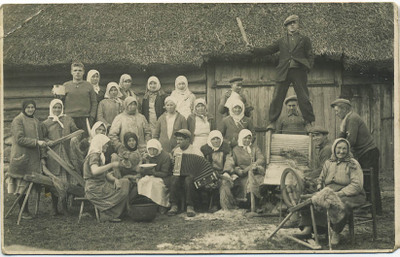 This photo of a scutching party is from the early 20th century and was taken in a village somewhere in eastern Europe. 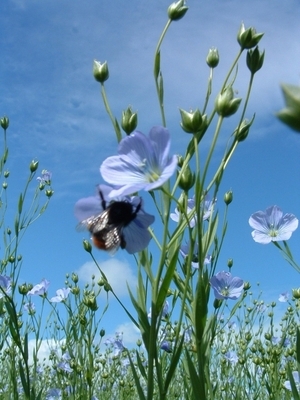 A field of flax flowers. . .and friend.